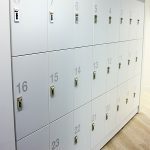 If your business is growing and you’re getting tight on space, it’s time to think about turning unproductive storage space into revenue producing areas. You don’t always have to get a bigger space; you just have to get smarter storage solutions to suit your needs. By considering storage solutions that do double duty, you can free up valuable space and save money. 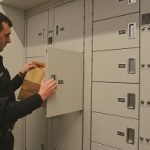 High-density mobile storage options will store whatever you have; file folders, minute books, corporate seals, law books, binders, boxes, evidence, or all of the above. There are many different options to choose from. Manual Systems are operated by users who open the aisles by pushing/pulling the handles left or right. 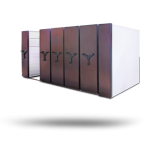 They are ideal for smaller, low-activity, limited access storage areas. Mechanical Assist Systems (also known as hand-crank operation) are opened by turning rotating drive handles. 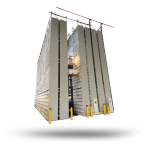 They are perfect for medium-sized storage systems with higher activity levels, heavier load factors, greater carriage lengths, and a larger number of system ranges. 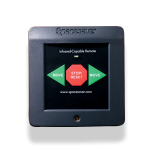 Lastly, Powered Systems (also known as Eclipse Systems) are operated by the push of a button. 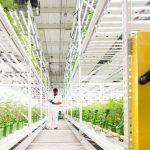 These systems work well in high-access applications where maximum safety, reliability, security, and protection of stored materials are key concerns. Wheelhouse High-Density Mobile Storage Systems are completely modular and easily adaptable. 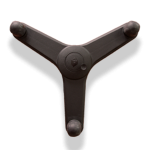 They offer a lot of strength while maintaining a low-profile system to optimize space. 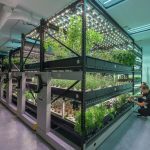 These systems are great for applications with mid-sized carriage length, a level floor, and low ceiling clearance. Wheelhouse is adaptable with any mode of operation including Powered, Mechanical Assist, or Manual. Click here to learn more. FrameWRX High-Density storage compresses two rows of storage into one, essentially saving an aisle. This technology allows endless reconfiguration of shelves, bins, pegs, and work surfaces without tools or fasteners. 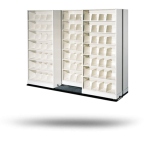 FrameWRX HD Storage Systems are excellent for pharmacy storage, Emergency, inpatient care medical storage, nursing station storage, and any kind of small loose items. Click here to learn more. 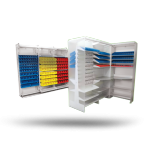 Modular Bi-File storage maximizes filing and storage by having two rows of filing equipment placed in nearly the same footprint where there was only one before. 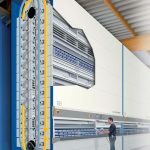 The front shelf sections rest on movable carriages that travel back and forth. 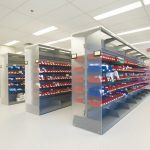 This movement gives access to the back row of stationary shelving, resulting in a high-efficiency storage system that greatly increases capacity in the same amount of space. These cabinets are ideal for small, narrow depth spaces. Click here to learn more. 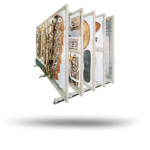 Mobile art rack systems ensure that your collections are properly stored and cared for. 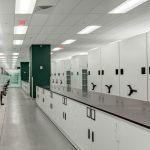 Spacesaver’s Hang-Glider Pro Storage Panel System is the most conservation-safe and space-efficient ceiling-suspended pullout storage panel on the market today. 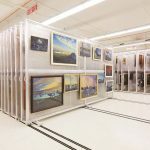 This panel system offers 2-dimensional storage so it is perfect for museums, art galleries, or any other business requiring conservation-safe art storage. Click here to learn more. 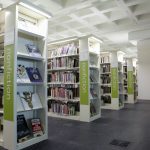 The XTend High-Bay Shelving products are made specifically for archival storage. 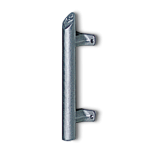 The shelves are heavy-guage, cold-rolled steel and are sized to optimize storage density. 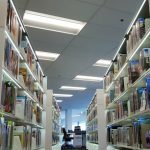 They are easily adjustable and can achieve up to 35 feet in height, with up to 30 tiers of shelves. 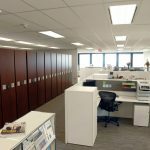 XTend high-bay shelving works for any type of business that requires significant, off-site archival storage space. Click here to learn more. How Can a Ferris Wheel Help your Sterile Processing Department?